Are you searching CG Police Recruitment 2018? If yes, then this is a right place for you. 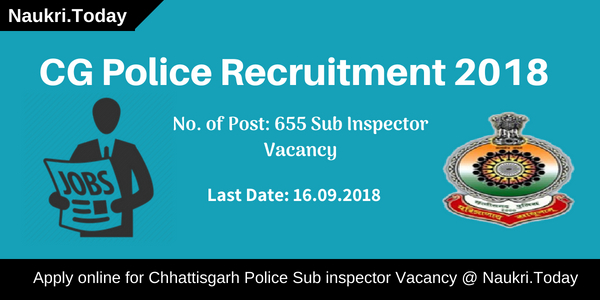 Chhattisgarh Police has recently published the advertisement for employment of 655 Sub Inspector Vacancy. CG Police Vacancy 2018 application form filled by candidates through online mode. Interested and eligible candidates can fill online application form either here or official site. Chhattisgarh Police SI Vacancy Apply online registration starts on 24th August 2018. Participants those are want to apply for CG Police Job can fill their form till the last date 16th September 2018. Furthermore, details regarding sub inspector post are mention on below article. Police Headquarter of Chhattisgarh is inviting online application for 655 उपनिरीक्षक भर्ती. This is a great opportunity for candidates who are want to CG Police SI Vacancy. So, don’t wait last minute rush and start to fill up Chhattisgarh Police Online Form 2018 from here as well as the official site. The last date for online registration is 16th September 2018. Rest of details like eligibility criteria, selection procedure and how to apply we mention on below segment. So read full article carefully to know information of CG Police SI Job 2018. How I Check Application Fees, Pay Scale & Selection Criteria For CG Police Constable Jobs 2018 ? How Can I Fill Online Form For CG Police Recruitment 2018 – Chhattisgarh Police Constable Bharti 2018 ? Applicants those are want to apply for CG Police SI vacancy also eligible for this. You require to check given below physical parameter, education qualification & age limit to ensure that you are eligible or not. In below section we provide you details of Chhattisgarh Police Vacancy Eligibility Criteria. Participants who want to fill Chhattisgarh Police Recruitment online form should not be less than 18 years as on 01.01.2018. The maximum age is require for Sub Inspector Job is 28 years. Upper age relaxation is applicable as per govt. rules. For CG Police Recruitment of Sub Inspector Post, applicants should complete their Graduation in any discipline from recognized university. Sub Inspector (Computer Vacancy), candidates should complete BCA, B.SC Computer Degree. Candidates should check Chhattisgarh Police Job Notification for rest information. Candidates those are selected for CG Police Recruitment 2018 will also receive an attractive salary. Applicants will get their salary as per pay matrix level-8. The initial salary of Chhattisgarh Police SI Job is Rs. 35400/-. Rest information check official advertisement, which is mention below. Participants will get select after they qualify physical measurement, physical efficiency test & written test. First physical test organize for candidates to select for next round. After that, written examination conduct at various center. Full information of CG Police Vacancy 2018 Physical test and written exam mention below. Interested and eligible candidates may fill Chhattisgarh Police SI Vacancy online form from here. In below section, you also get some easy steps to fill up your application form. First of all, visit to the official site cgpolice.gov.in. Collect CG Police Sub Inspector Recruitment notification 2018. Then go to Apply online for Chhattisgarh Police Job 2018.
now upload signature and photograph on your CG Police Recruitment Application Form. Submit your CG Police Job online form and then take hard copy of it for future uses. Conclusion: Chhattisgarh Police Department has issued notification for recruitment of 655 Sub inspector posts. The online registration of CG Police Recruitment 2018 has started on 24th August 2018. Applicants can submit their online form of CG Police SI Jobs till last date 16.09.2018. If you are looking for CG Police Recruitment 2018? then here is a golden opportunity available for you. Chhattisgarh Police Department released a notification of 215 Constable (Telecom), Driver & DEO Vacancy. Eligible and Interested candidates can apply for CG Police Constable Recruitment 2018. Online Registration has started from 15.05.2018 for constable Vacancy. Participants must collect brief details like eligibility criteria, selection method, etc for Chhattisgarh Police Constable given below. As we all Know Chhattisgarh Police has published notification of Direct Recruitment on 215 Constable and Other Vacancies. Participants who are interested in Police Jobs must apply for CG Police Recruitment. Online Registration for Chhattisgarh Police Vacancy 2018 last date is 14.06.2018. Candidates may also download CG Police Notification 2018 either from here or from official website. Candidates before applying for CG Police Vacancy 2018 check Eligibility Criteria from here. It is important to check Eligibility criteria otherwise CG Police Constable Recruitment 2018 Application forms will be rejected. Below given paragraph contains information regarding Minimum Qualification & Age Criteria for Chhattisgarh Police Constable Vacancy 2018. Candidates who are applying for CG Police Recruitment 2018 can check their Education Qualification post wise from here. Constable (Telecommunication) : Candidates must hold 10+2 pass certificate from recognized Board with having subjects Physics, Chemistry or Mathematics for Chhattisgarh Police Constable Bharti. Constable (MT) : For CG Police Constable Bharti Applicants should hold 10th or 12th pass certificate from recognized Board. Data Entry Operator : Candidates must have 10+2 pass certificate from recognized Institution of Chhattisgarh. Applicants also contains Diploma/ Graduation in First Year Typing Speed in Hindi or English with 8000 key Depression per hour. Male candidates who belong to General & OBC category they must have chest measurement 81 cm without swell. For SC/ST category candidates they must have 76 cm chest measurement for CG Police Job 2018. For more information candidates can check CG Police Constable Vacancy 2018 Notification. Participants are required to fulfill Physical Standard for Chhattisgarh Police Bharti 2018.Here we provided you table which shows you Height Measurement of Male and Female Candidates. Candidates must have minimum age limit 18 years old for CG Police Vacancy 2018. Maximum Age Limit should not more than 28 years old. Candidates can see age relaxation which is divided categories wise as per rules of Government. Applicants can deposit the application fees through online mode with (Debit card/ Credit card/ Net Banking). General & OBC category candidates have to pay Rs 200/- as application fees. SC/ST belonging category candidates have to pay Rs 125/- as application fees for CG Police Bharti 2018. Candidates should be selected on the basis of Physical Efficiency Test & Written Examination for CG Police Jobs 2018. Applicants who cleared the PET will be allowed to get appear for Written Examination. After PET & Written Examination final list will be prepared on basis of performance of candidates for CG Police Bharti 2018. The Department will offered a good amount of salary to candidates who are selected for CG Police Recruitment 2018. Selected candidates will get a salary according to pay Matrix level as shown below . Candidates can check the simple steps to fill online Application Form for CG Police Bharti 2018. Participants should read this article carefully before applying for CG Police Bharti 2018. Here we provided you links to download CG Police Vacancy 2018 Notification. At Homepage search for Chhattisgarh Police Constable Recruitment 2018 Notification pdf. Applicants must require to read CG Police Constable Bharti 2018 Notification carefully. Candidates must fill up Chhattisgarh Police Constable Bharti 2018 Application Form. Upload the scanned colored photograph & Signature in CG Police Job 2018 Application Form. Then recheck Chhattisgarh Police Constable Job 2018 Form. Deposit CG Police Recruitment 2018 Application Fees. Candidates must take out print of Application Form for future use. Conclusion : CG Police Constable Recruitment has issued a notice for filling up 215 Constable & DEO Vacancies. Eligible applicants can apply online for Chhattisgarh Police Constable Bharti 2018 till closing date i.e. 14.06.2018. Participants may also check Eligibility criteria, age Limit and much more here. Dear Applicants Chhattisgarh Police Department has now released notification for recruiting candidates on Various Constable Posts. There are total 1786 Constable GD, Driver & Tradesman Vacancies. If you are interested in CG Police Recruitment 2018 then fill application form for Chhattisgarh Police Vacancies from here. Mode of submit application form through online mode. Closing Date of applying online application for CG Police Constable Jobs is 15th February 2018. In this section you can check post wise CG Police Jobs Details. Full details you can also check from official Chhattisgarh Police Vacancies Notification. Applicants who are going to fill online form for CG Police Jobs 2018 can check post wise required Eligibility Criteria from this section. Our team is providing full details about Education & Age Criteria For Chhattisgarh Police Vacancies. Candidates must check required education qualification for Chhattisgarh Police Constable Recruitment from below section. Appliers must check Physical Standard for CG Police Bharti from official notification. Constable GD Jobs : Candidates must have passed 10th Class under 10+2 System from any recognized Board. MT Driver Jobs : 8th passed candidates with having Driving License of Heavy Vehicle for CG Police Driver Vacancies. Remaining Tradesman Posts : 8th Pass with experience in respective trade. Minimum age of the candidates for CG Police Recruitment 2018 must be 18 years & Upper age must be 28 years as on 01.01.2018. Relaxation in age for CG Police Tradesman Vacancies is applicable up to 05 years for SC/ST/OBC category & for other category you can check from official notification. Candidates of General/OBC Category needs to pay Rs. 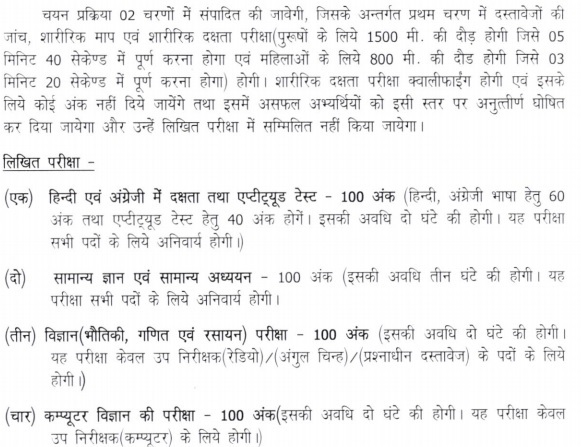 200/- as application fees for CG Police Recruitment 2018. Other category candidates of SC/ST Category must paid Rs. 125/- for filling online form for Chhattisgarh Police Recruitment 2018. Fees must be deposit through online mode. Candidates who will selected for CG Police Vacancies 2018 paid a good salary as per organization norms. After Joining, candidates will paid Rs,. 19,500/- per month for CG Police Constable Jobs 2018. Selection of the candidates for CG Police Recruitment 2018 will made on the basis of Department Exam Scheme. Final Merit List will decided the selected candidates. 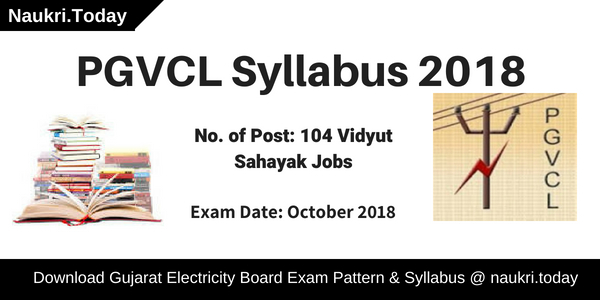 Applicants can check Full exam Pattern & Syllabus for CG Police Constable Vacancies from here by reading Chhattisgarh Police Exam Syllabus 2018. For more details read the official notification & Keep stay with this page for more updates. Now click on Recruitment Section & Click on CG Police Constable Recruitment Notification link. Read all the information mention in official notification. Fill all required information in form form properly. Recheck all details filled in Chhattisgarh police Jobs application Form before submission. 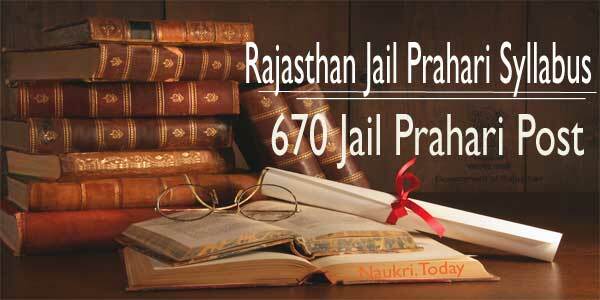 Conclusion : – CG Police Recruitment 2018 For 1786 Constable Vacancies. Candidates can fill online form for CG Police Vacancies on or before the last date 15.02.2018. rest of the details you can check from official Chhattisgarh Police Jobs Notification.